What Other Discomforts Can Chiropractic Help? Do you have a Chart of Effects of Spinal Misalignments? Nervous System Physiology - What is the Safety Pin theory? In the words of New Zealand government's inquiry, chiropractic care is "remarkably safe." Chiropractic has an excellent safety record. It is the result of a conservation approach to health that avoids invasive procedures or addictive drugs. Today's Doctor of Chiropractic is well educated. The science of Chiropractic requires a special emphasis on anatomy, physiology, pathology, neurology, biomechanics, X-ray, spinal adjusting techniques, and related subjects. 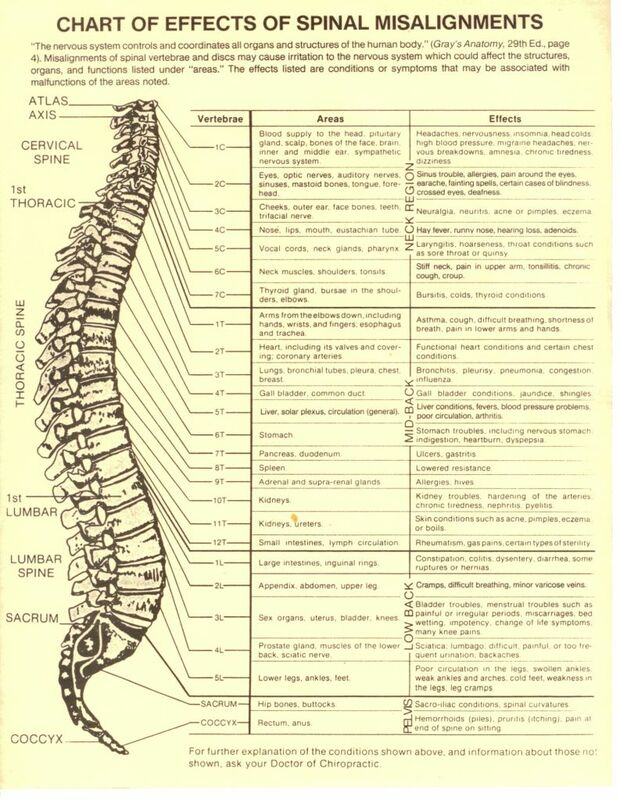 This demanding curriculum prepares Chiropractic Doctors to locate the Vertebral Subluxation and helps correct the resulting nervous system dysfunction. Since significant spinal trauma can occur at birth, many parents have their newborns checked for Vertebral Subluxation. Later, learning to walk, ride a bicycle, and other childhood activities can cause spinal problems. While a bandage and some comforting words can help a skinned knee, the unseen damage to the child's spine is the unique domain of a chiropractic office. Many childhood health complaints that are brushed off as "growing pains" can often be traced to the spine. Regular chiropractic checkups can identify these problems and help avoid many of the health complaints see later in adults. In other words, a subluxation is a misalignment of a vertebrae causing pressure or interference on the nervous system which can lead to any number of pains and symptoms throughout the body. Since Chiropractic adjustment is a specific force, applied in a specific direction, to a specific spinal joint, it is virtually impossible to adjust oneself. It is possible to turn or bend or twist in certain ways to create a "popping" sound, like the sound that sometimes accompanies a Chiropractic Adjustment. Unfortunately, this type of joint manipulations is usually counterproductive, often making an already unstable area of the spine even more unsteady. Adjusting the spine is not for amateurs! Chiropractic can giving soothing Pain Relief to: Back Pain, Neck Pain, Headaches, Stress, Fatigue, Allergies/Sinus, Nervousness, Digestive Problems, Sleeping Problems, Shoulder Pain, Arm/Leg Pain, Carpal Tunnel, Tension, Irritability/Mood Swings, Sore Jaw, Colic, Ear Infections, Pregnancy Discomforts/Troubles. When spinal vertebrae pinch or choke nerves affected organs and tissues don't work the way they should and ill-health results. The nervous system is vulnerable where delicate nerve tissue comes into proximity with the moving bones of your spine. That's why we're interested in your spine!